It’s not an easy season to talk about public safety. The conversations happening around law enforcement, shootings, race relations, activism and our general American identity are tense. They’re heavy. But while I’m no expert on any of these topics, I am certain of one thing: We must keep talking. I don’t mean we should continue ranting to our like-minded social circles, either. I mean we need to commit to having helpful, patient conversations with people who don’t share our worldviews. We need to seek practical understanding, without worrying about whether we agree. Can this be frustrating? You bet it can. But we cannot overcome this brokenness without unity. We cannot overcome this brokenness without doing the work – the hard work – it takes to come together and develop actual solutions. May we all care more about being effective than being right. There’s no room for believing the criminal justice system is without flaw, but that doesn’t mean there isn’t room for celebrating success. At times like these, when the world feels dark, I think it’s important to see light where it shines. Because of that, I wanted to share a few stories about public safety agencies and professionals that have been a bright spot. North Little Rock Police Officer Tommy Norman has become a true representative of community policing. Visit his Instagram or other social media pages (Twitter, Facebook) and you’ll see just how special he is. Norman has worked day in and day out in his Arkansas community to engage its residents, especially the children. He knows them, and they know him. His fans from across the nation even send gifts to the children by name. He dives deep, really deep, and the payoff shows in the community’s smiles. 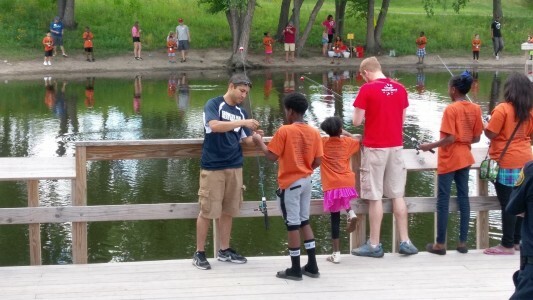 In the Minneapolis suburb of Brooklyn Park, they recently held their eighth annual Cops ‘n’ Kids Fishing Tournament. For this event, the Brooklyn Park Police Department picks up local children and brings them to a community fishing pond. Once there, they get a fishing pole, T-shirt, prizes and lunch. On top of that, they learn how to fish from the officers (or teach the officers a thing or two), competing for the biggest catch of the day. Both the children and police look forward to this event each year, where they have the opportunity to get to know each other on a personal level, instead of on an emergency call. So this story is a little old by now, but hopefully it will still put a smile on your face. Two police officers in Newark, Delaware, decided to hit the pavements with large “Free Hugs” signs. There’s still a video up that covers the day (May 2015), which is worth a watch. It’s lighthearted and a little silly, but consistently finding unconventional ways for law enforcement and those they serve to get close without an emergency is a great way to improve community relationships and encourage communication. California’s Santa Clara County Fire Department knows about community outreach. Two of their efforts I find especially cool are SafeSitter Baby-sitting Training and the Youth Firesetter Intervention Program (YFIP). According to their website, “YFIP is an intervention and educational program aimed at reducing the number of fires and burn injuries caused by youth experimenting with fire.” Youth who’ve been caught firesetting or simply expressed interest in firesetting can sign up to attend the workshop and learn about things like fire safety and self-esteem. The program aims to prevent firesetting tendencies from escalating, by educating children instead of punishing them. Here is another lighthearted story. This spring, two Huntington Beach police officer responded to call of a suspicious vehicle. When they arrived on scene to check it out, they discovered it was a mother and her daughter who were living out of the vehicle. Instead of simply telling them they couldn’t stay parked there, one of the officers spent time with the mother, making calls and helping her find housing. The other officer, meanwhile, taught the daughter how to play hopscotch. The video is pretty great, and the hopscotch lesson is serious business. No touching the lines! And, of course, if you haven’t yet looked into the “Running Man Challenge,” you can see some of the best videos here. Your turn! Leave a comment or send me an email with something you’ve seen public safety professionals do that did your community some good. May we never let the darkness, while real, blind us to the light. Author: Emily G. Paulson is an MPA student at Hamline University’s School of Business in Minneapolis. She’s carving out a career in public safety and organizational learning, and believes in firm handshakes and shameless smiles. Contact her at [email protected].